Venice of the Middle Ages and early modern period was not merely a hub for trade flowing between Western Europe and the East but also a hub for peoples from all over. Many Venetians are proud to view their blood as mixed, in the sense that they are all descendants of the various ethnic and religious minorities that were attracted to and resided in the floating city during these periods. Just as the populations of the Christian populations were diverse, so to were those of the Jews in Venice. The Jews in Venice have had a continuous presence since the 14th century. The Doge and the Venetian government wanted the Jews for their usury since Christian merchants were dogmatically forbidden from charging loans with interest. The Jewish moneychangers were essential for Venice’s primary business: trade. Without the ability to create loans and interest payments, massive, international trade, in which Venice was involved, would be impossible. The first Jews to come to Venice were the Ashkenazi, coming mainly from the Carinthia region of Austria to escape religious persecutions from the lands of the Holy Roman Empire. The Sephardic community, coming from places such as Naples, Spain, and Corfu, came to Venice following the expulsion of the Jews from the Spanish Empire. 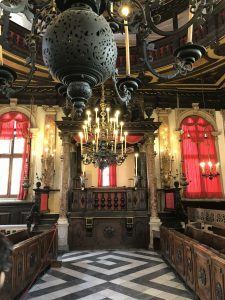 The diversity in the Jewish populations led to diversity in religious and social life: despite the persecution of the Jews and the ghetto and their relatively small number, Venice became home to five different synagogues, a German, a French, an Italian, and two Spanish scuole. The five synagogues were located in the Jewish Ghetto of Venice. Although still a center of Jewish life in the city, most Jews today live in the center of the city. The Jewish ghetto, gated off from the rest of the city, was opened temporarilty in 1797 following the French takeover of the Republic of Venice and permanently in 1866 when Venice was liberated from the Habsburg Empire and annexed to the Kingdom of Italy. The first synagogue we visited on the tour was the German synagogue, connectly directly to the Jewish Museum. There are three main details about this synagogue which are unique: firstly, like the other synagogues in the ghetto, the German scuola was bipolar, meaning the bimah and the Ark were located across from one another on either side of the oval room. Secondly, the synagogue was surrounded by marmorino, a cheaper alternative to marble. This detail is very emblematic of the situation of Jews living in Venice at the time of the Republic. Church authorities prevented Jews from buying marble to build their synagogues because the material was commonly used in churches. Thus, the community leaders purchased the alternative material. Although the Venetians needed the Jews and their professions for the survival of Venetian trade in Italy and in the Mediterranean, they were still treated as less-than-equals with Christians, and were publicly embarrassed for this prohibition on marble. 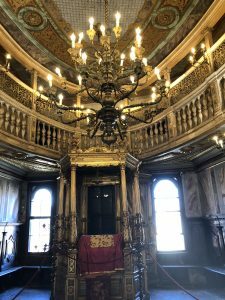 After visiting the other synagogues and seeing the different decorum of the rooms (pictures attached), the question of Jewish identity came into my mind. 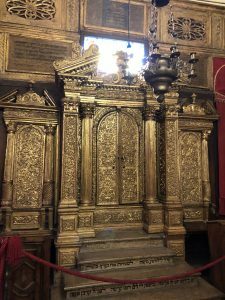 Because the Jews of Venice created five separate synagogues for their respective communities, the overall community must not have been as united as the Venetians who locked the ghetto thought. The Jews of Venice kept the customs of their homelands, including liturgical rites, language, and cuisine. The diversity amongst the Jewish inhabitants of the ghetto counters the marginalization that church and government officials promoted for this minority on their island. This entry was posted in Jewish Italy and its Literatures by SEZ. Bookmark the permalink.